For something that sounds so imposing—Citadel—the plushest member of the Dodge Durango family of large sport-utility vehicles is pretty inviting. It is nicely appointed with comfortable seating, and it packs a lot of comfort and convenience features into its 3-row-SUV body. Durango’s “just right” dimensions are usefully larger than the biggest midsize SUVs, but smaller and more tractable than the typical large SUV. Appearance and powerteams haven’t changed since Durango’s major freshening for 2014. Updates since then have been fairly subtle, mostly centered on option packages. For 2016, the base V6 engine gains automatic start/stop capability in a bid to improve fuel economy. Meanwhile, a “Sport” mode that alters steering, throttle, and transmission response is newly standard on all Durangos. Also, the Uconnect infotainment system gains new features such as Siri Eyes Free functionality for Apple iPhone, and some new trim features and appearance packages are offered. 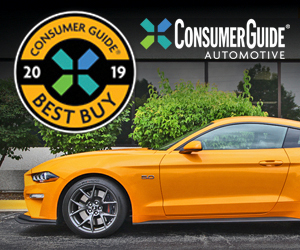 Perhaps not surprisingly, then, one other thing that remains constant for the Durango is its place as a Consumer Guide® “Best Buy” in the large SUV class. CG editors logged time in a V6 all-wheel-drive Citadel with one of the new option groups. 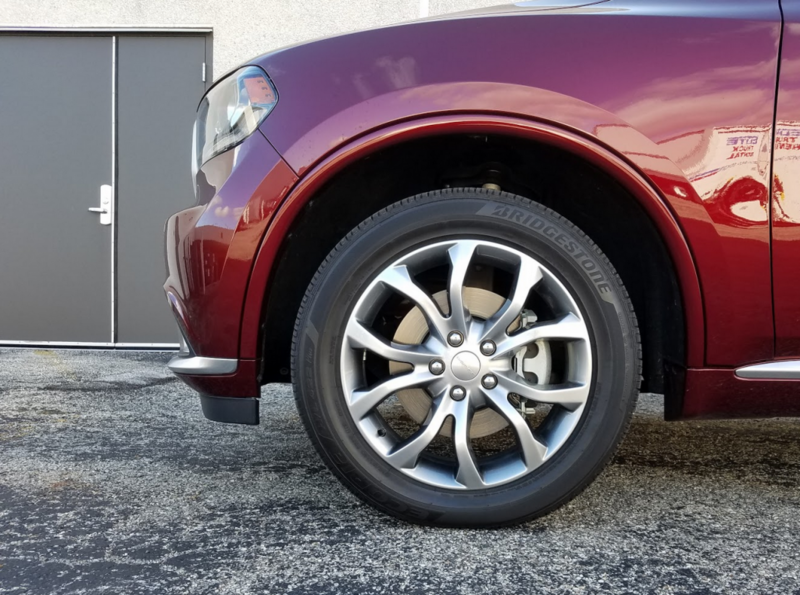 While the Anodized Platinum Package doesn’t improve the dynamics or usefulness of the Durango (Dodge describes the $1095 option as “new bling to customize your ride”), neither does it detract from what’s already there. 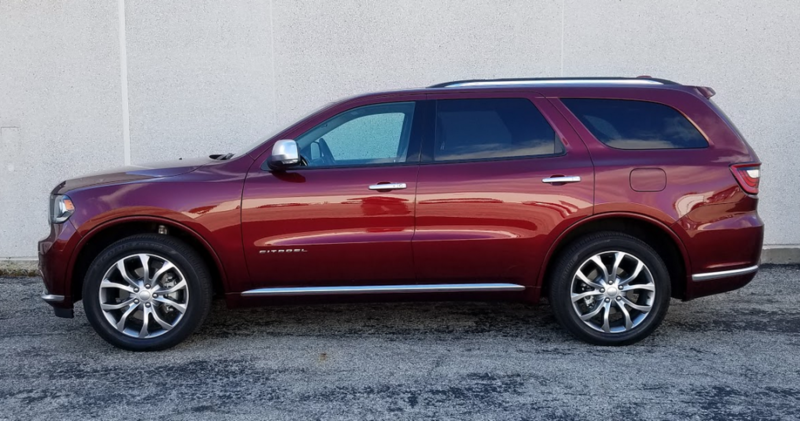 In its upper trim levels, Durango’s roomy cabin is finished nicely enough to blur the lines between mainstream and luxury. The 3.6-liter 295-horsepower V6 provides decent power—nothing quite like the optional 5.7-liter Hemi V8 of course—with good fuel mileage for a vehicle of its size and type. While off-the-line acceleration won’t tingle any spines, neither will it frustrate drivers who expect to get moving very soon after their foot gets on the gas pedal. The noise level under acceleration isn’t obtrusive or persistent; once the engine finds its happy place, it runs fairly quietly. Highway cruising power is about as good, so merging and passing don’t present problems. Punching up the Sport mode makes a minimal impact on engine performance. The ZF-built adaptive 8-speed automatic transmission performed as it has in previous Durango tests, delivering excellent service in expressway and city-street commuting. A selectable “Eco” mode influences the shift schedule and fuel delivery for more frugal operation. With the new stop/start feature (which can be switched off), AWD V6 Durangos have gained one mpg in their EPA mileage ratings, which are 18 mpg in city driving, 25 on the highway, and 21 combined. With stop/start and Eco mode activated for part of his 181.1-mile stretch in the test truck, this reviewer averaged 18.22 mpg with 68-percent city driving. A wide hatch opening and spacious cargo area make Durango a fine choice for families with lots of stuff to move around. Thanks to its fully independent suspension, the Durango rides pretty well for a large SUV outside the big-bucks class. Fairly quick steering response gets a degree or two crisper in Sport mode. There’s some cornering lean but nothing intolerable. The Citadel is Durango’s luxury leader with a starting price of $43,895 for an all-wheel-drive version. (Only the performance-oriented V8-powered R/T costs more—by just $600 with AWD.) 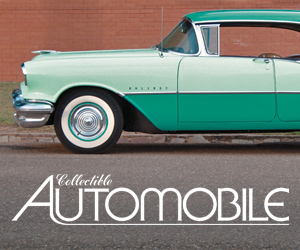 Buyers who can get by with rear-wheel drive stand to save $2600. Citadels come kitted out with a rearview camera, rear parking assist, push-button starting, Nappa-leather upholstery, heated front- and middle-row seats, heated leather-wrapped steering wheel, driver’s-seat memory settings, power sunroof, tri-zone climate control, and power tilt/telescoping steering column. Infotainment comes in the form of the premium Uconnect system with an 8.4-inch touchscreen, navigation, satellite radio with travel and traffic information, and voice-receptive Bluetooth hands-free phone connectivity. Among the Anodized Platinum Package’s special appearance features are handsome 20-inch “Satin Carbon Finish” wheels. The black-and-beige interior in CG’s Velvet Red Pearlcoat test vehicle was gussied up with woodgrain highlights on the dashboard and doors. Soft, flexible surfaces covered the upper half of the dash and much of the door panels. “Instruments” show up well on a thin-film-transistor color display. Climate and audio settings can be worked with buttons and knobs beneath the big touchscreen, but selections for those devices, navigation, and other functions can be accessed on the screen. The transmission selector is a dial on the console but the Citadel also comes with paddle shifters mounted on the steering wheel. Second-row passengers have seat-heat controls in the back of the console and a trio of climate-control dials in the roof. Option packages added to the test truck brought the final price, with delivery, to $52,760. They contributed more electronic safety monitors, trailering gear, rear-seat DVD entertainment system, and second-row captain’s chairs with center console. The Anodized Platinum Package modifies appearances with 20-inch satin-carbon alloy wheels, platinum grille detailing, and platinum highlights elsewhere around the exterior. Headroom is good in the first two rows but less so all the way in back. Front legroom is plentiful, but tall middle-row passengers hoping for acceptable stretch-out space may find themselves hoping that the folks in front of them don’t need to track all the way back. Unlike some three-row SUVs, the Durango’s third row will accommodate a couple of medium-height adults—cushion height and legroom are just passable for that. Getting back there takes a little work. Overall, though, step-in height isn’t a challenge. Cabin storage is pretty good, but the disc player for the entertainment system is located in the front console box, where it consumes much of the available space. Indeed, the middle-row console with the optional captain’s chairs has a considerably larger covered cubby—with a USB-charging port and a 12-volt outlet to boot. All doors bear pockets with bottle holders. Cargo space with all seats up is limited, albeit with some additional room under the floor. Third-row seats fold completely flat at the pull of a cord found at the rear of the vehicle. Middle-row seats also drop flat when further cargo space is needed but the captain’s chairs leave some gaps in the surface. 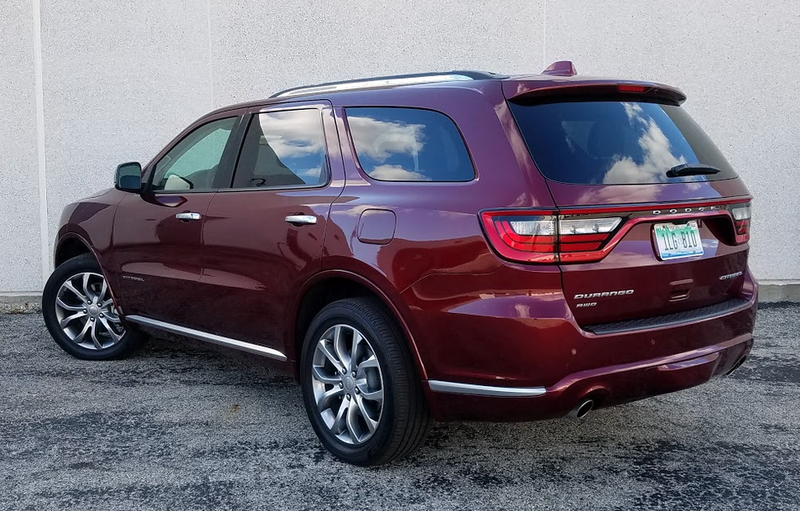 The basic Durango platform is one of the oldest in the SUV market, but it continues to score big points with us for its sweet-spot positioning between the midsize- and large-SUV segments. For SUV buyers who need a lot of space and better towing capacity than a midsize SUV can offer, but also value relatively decent fuel economy and maneuverability, a V6-powered Durango remains an attractive, best-of-both-worlds proposition. 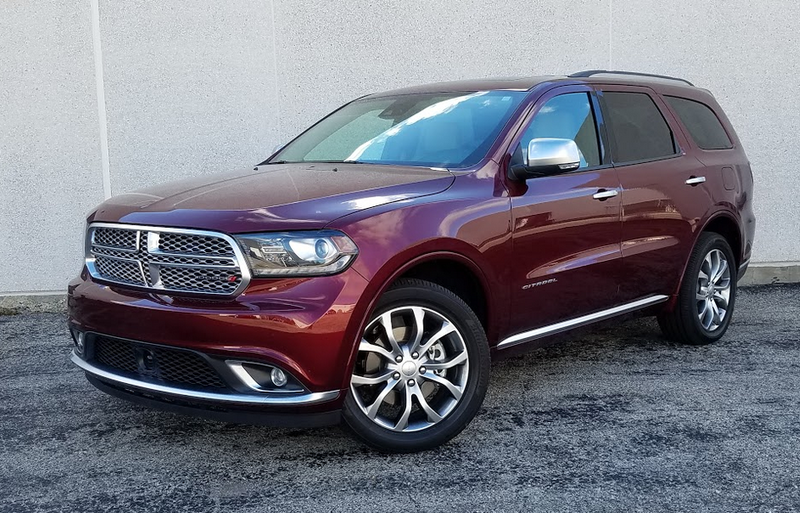 Though it’s growing long in tooth, the Durango remains an excellent SUV/crossover choice for shoppers seeking something a little larger–and possibly more refined–than a midsize crossover. Written by: The Daily Drive staff on December 6, 2016.on March 22, 2019.